Everyone loves fresh flowers, but not the hassle that comes with them. Between keeping the flowers watered and refrigerated to avoid wilting, or worrying about being delivered on time for your special event, real flowers fall flat. Paper flowers are the unique, economical way to have all the beauty without the inconvenience real flowers bring. No water needed– Forget messy transportation, or concerns about keeping the flowers alive- you have better things to worry about on your big day! Paper flowers always stay fresh and beautiful! Reliable delivery– Since these flowers stay fresh without water or refrigeration, they can be delivered prior to your event. No stress about them wilting, or arriving late the day of your event! Economical– Flowers can be rented for multiple days to be used for many purposes (i.e. wedding rehearsal dinners, photos, and the ceremony). 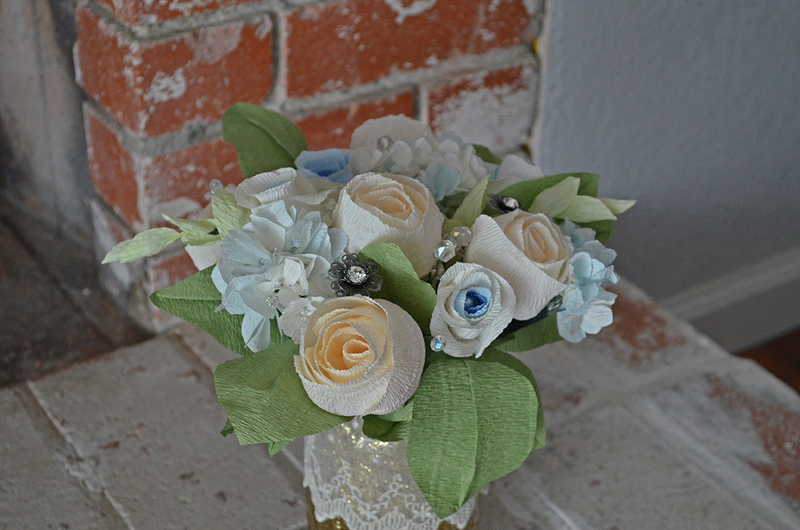 Paper flowers are also typically a more affordable option than fresh flowers. Our flowers are reusable, so we pass the savings onto you! Rental agreements are also available for businesses that would like a new arrangement delivered on a regular basis for ongoing beauty in the workplace. Beautiful photography– It can be -5 degrees or 115 degrees and your flowers will always look beautiful. Never worry about wilting or browning. The perfect unique touch– Paper flowers provide the DIY touch without the effort! Make your event stand out amongst the others with this individual, unexpected detail. From a rustic-themed wedding to a sleek and modern party, these flowers are beautiful for any theme. Beautiful year round– Paper flowers are always in season, no need to worry if your favorite buds are hard to get. Also, follow us to see our holiday-themed creations as the seasons change! Ongoing beauty– Always have a beautiful bouquet in your home or business! Maintain the look of beautiful fresh flowers without changing smelly water, or throwing them away as they wilt. Hypoallergenic– Great for hospitals and the allergy prone flower lover. Also, no annoying pollen to clean up!